The mission of the Public Works Department is to provide and maintain the highest quality public works services and facilities for the residents and businesses of the City of Bloomfield. This department is also responsible for the general management, operation and care of the City’s infrastructure. Each employee is accountable for providing professional services that are in the best interest of the City of Bloomfield. 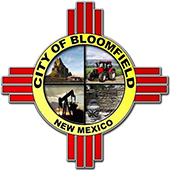 For after hours emergencies, please call the dispatch center at (505) 334-6622 to request the City of Bloomfield’s Public Works on-call personnel to respond. Be prepared to give your name, phone number, address and the nature of your call. Capital Project Management, including planning, design, bidding, construction, inspection, and commissioning. New improvements at Cultural Center/Fitness Center were part of the Transition Plan. The City Engineer/Public Works Director is the ADA Coordinator. The ADA Transition Plan and Policy Statement has been prepared to comply with state and federal requirements so that the City can remain eligible for federal funding through NMDOT. The documents are available below. The Plan was approved by Council on December11, 2017. If you have any questions, comments, or requests for specific improvements to improve accessibility at a City-owned facility or in the City Right of Way, please contact the ADA Coordinator.